Esperance is a town in the Goldfields-Esperance region of Western Australia, on the Southern Ocean coastline approximately 720km east-southeast of the state capital, Perth. On the 8th (Mon), you'll have a packed day of sightseeing: enjoy the sand and surf at Lucky Bay, kick back and relax at Twilight Bay, and then make a trip to Esperance Whale Tail. To see where to stay, reviews, ratings, and more tourist information, use the Esperance trip builder website . Sydney to Esperance is an approximately 10.5-hour flight. You can also do a combination of flight and car; or drive. Due to the time zone difference, you'll gain 2 hours traveling from Sydney to Esperance. Traveling from Sydney in July, you will find days in Esperance are a bit cooler (18°C), and nights are about the same (8°C). Finish your sightseeing early on the 9th (Tue) so you can drive to Albany. Kick off your visit on the 10th (Wed): see the interesting displays at Western Australian Museum - Albany, kick back and relax at Emu Point, and then contemplate the waterfront views at Kalgan River. Keep things going the next day: get up close to creatures of the deep with a dolphin and whale watching tour. To see traveler tips, maps, and more tourist information, you can read our Albany trip itinerary app . Drive from Esperance to Albany in 5 hours. Alternatively, you can fly; or take a bus. In July, plan for daily highs up to 19°C, and evening lows to 7°C. Wrap up your sightseeing on the 11th (Thu) to allow time to drive to Bunbury. Explore hidden gems such as Sunflowers Animal Farm and Gnarabup Beach. Appreciate the collections at Sensei Pots Art Gallery Yallingup and Christian Fletcher Gallery. Explore Bunbury's surroundings by going to Surfers Point (in Prevelly) and Yallingup (Yallingup Maze & Yallingup Beach). Next up on the itinerary: stroll through Bunbury Wildlife Park. For photos, ratings, reviews, and more tourist information, go to the Bunbury travel route planning site . You can drive from Albany to Bunbury in 4.5 hours. Alternatively, you can do a combination of flight and bus; or take a bus. Cap off your sightseeing on the 14th (Sun) early enough to go by car to Perth. 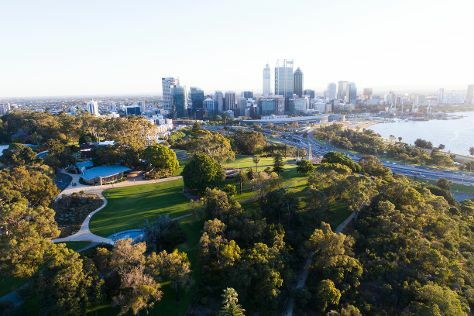 On the 15th (Mon), explore the world behind art at Art Gallery of Western Australia, get engrossed in the history at The Nostalgia Box Museum, then explore the activities along Swan River, and finally make a trip to Elizabeth Quay. Get ready for a full day of sightseeing on the 16th (Tue): view the masterpieces at Aspects of Kings Park, stroll around Kings Park & Botanic Garden, then contemplate in the serene atmosphere at St. George's Cathedral, then contemplate the long history of The Perth Mint, and finally contemplate in the serene atmosphere at St. Mary's Cathedral. For where to stay, maps, and more tourist information, read our Perth trip planner . Traveling by car from Bunbury to Perth takes 2 hours. Alternatively, you can take a train; or take a bus. In July, daily temperatures in Perth can reach 21°C, while at night they dip to 8°C. Wrap up your sightseeing on the 16th (Tue) early enough to travel to Broome. You'll visit kid-friendly attractions like Dolphin & Whale Watching and Cable Beach. Step off the beaten path and head to Staircase To The Moon and Catholic Diocese of Broome. There's lots more to do: see what you can catch with a fishing tour, see the interesting displays at SSJG Heritage Centre, explore the different monuments and memorials at Japanese Cemetery, and identify plant and animal life at Broome Bird Observatory. Plan my Broome trip by asking Inpirock to come up with tips and suggestions. Traveling by flight from Perth to Broome takes 4.5 hours. Alternatively, you can drive; or take a bus. Traveling from Perth in July, expect nights in Broome to be somewhat warmer, around 17°C, while days are much warmer, around 35°C. On the 20th (Sat), wrap the sightseeing up by early afternoon so you can travel back home.